I adore Felicia Day, but I have mixed feelings about Charlie; the good at everything, super smart, adorable, walking pop culture reference she portrays. Charlie feels like a bit of an anomaly at times in the Winchester universe, something that is compounded by the writing style of Robbie Thompson, who wrote this week’s script. Charlie is his invention of course, and one might say, she is his Mary Sue. Robbie tends to write in reflection. It is not a coincidence that in almost every episode of his, mirrors play a role. Robbie’s stories are mostly metaphorical, one layer removed from the actual action, observing rather than participating. In Bitten (S8.04), the story reflects and comments on the world of monsters and hunting, without really involving the brothers themselves. In Metafiction (S9.04), the story of Metatron comments on the Winchesters’ world and even on the show itself, and in Fanfiction (S10.05), Thompson’s script turns a mirror on the fan created space around Supernatural as a work of fiction. In There’s No Place Like Home, Charlie’s fractured personality is a clear metaphor for the Winchesters’ current struggle between dark and light. There is often some kind of parallel between the MOTW’s plight and whatever is going on with Sam and Dean at the time, but as a plot device, it should not only be used sparingly, it should serve to move the main storyline forward and impact the main character arcs. There’s No Place Like Home did neither. The parallels were heavy-handed and Charlie’s was really the only story. It was as if all the action took place in the mirror, and none in the world it was supposed to be reflecting. That said, I found the image that was offered an interesting one. It was a departure from the now ubiquitous “monster within” theme of the season, as it actually gave a more nuanced take on the consequences of being good or bad. Charlie comes back from Oz split in two. As she tells it, the only way to win the war over the Emerald City, was to release and separate her dark side with the aid of the key to the portal to Oz. Once her remaining good self became aware of the misdeeds of her id however, she was so repulsed that she rejected that part of herself and decided it was better to live apart than to reunite as one. Her bad self, now free from the burden of conscience, damaged the key that could have merged them back together. When Sam and Dean get wind of her return from the Land of Oz, they are surprised to find a Dark!Charlie beating information out of all the officials associated with the accident that killed her parents. She is set on finding the drunk driver responsible, who has bribed his way out of paying any consequences for his actions. She seeks payback in order to reconcile with her good self. As Sam goes with Good!Charlie to find a way to repair the key, Dean stays to keep an eye on Dark!Charlie and stop her from crossing a line. There is a lot for Sam and Dean to recognize. Celeste Middleton, aka Charlie Bradbury had an angry childhood, full of anger and rebellion. Her dark side wants to seek revenge on the creature who killed her family and destroyed her life, much in the way John started them on their own path. Dark!Charlie’s tempts Dean with the vices he has vowed to give up in order to keep the Mark at bay. She tells him that being bad is pure and free of guilt and that she, after all, is not the monster. She waged a just war and the man who killed her family deserved to die. This Charlie recognizes that the dark in Dean has always been there and is not just a result of the stamp on his soul; and Dean knows it too. Dean is anything but free of guilt, in fact guilt is practically Dean Winchester’s middle name. Dark!Charlie also labels Sam as “all good guy code, with no bite” and the albatross around Dean’s neck. Of course Sam is not a mere weight holding Dean down; Sam is the one who pulls him back from the brink of darkness. It is no coincidence that Sam is with Good!Charlie throughout the episode. Sam is the light in this season’s arc, he is the conscience, the anchor, the faith. However, Sam knows darkness all too well. Not only has he lived much of his life under its weight, he also has shown himself willing to embrace it again, in order to save his brother. As hunters, they both have often skirted the edge; waging that just war and killing the monsters they deem deserving. Sam and Good!Charlie track down a Man of Letters, Clive Dillon (Duncan Fraser) the one who long ago opened the portal to Oz. He also had himself split in two, leaving his id to rule Oz as the infamous Wizard (Carter Kinsella), bringing his good self back to earth. Since the only remaining key is irreparably damaged, the only way to reunite with his other half is to mortally wound himself. Since the two selves remain physically connected, this will summon the wizard who to save his own life will have to save them both. Dean holds back Dark!Charlie in a brutal fight that was uncomfortable to watch at times. He is certainly defending against her attacks and at first clearly restrains himself, but as things escalate he purposely snaps the bone in her arm without hesitation and even when she is down, continues to pummel her, forgetting that he is hurting the other Charlie too. If we were ever doubtful that Dean was crossing lines, this moment certainly should erase them. Good!Charlie in the meantime crosses a line of her own. It turns out that in order to save herself and Sam, who is being strangled by the evil wizard, she has to do something that goes against her nature. She has to touch the dark side and kill. She points a gun at Clive’s head and as he tells her that he forgives her, she pulls the trigger. Only now can the two halves of Charlie reunite. As Sam gently lays them side by side, Dark!Charlie says she knew she had it in her all along; just like for the original Dorothy, the power to go home was right there for her to find. Charlie had to stop rejecting her dark side in order to find balance. Even though Charlie says she forgives Dean and promises that this darkness will not overcome him, he clearly is devastated. He looks ashamed and defeated and can hardly look her in the eye. When Charlie tells him that he has one thing that Cain didn’t have to help him overcome the pull of the Mark, Dean’s eyes find Sam, as Charlie says he is a Winchester after all. 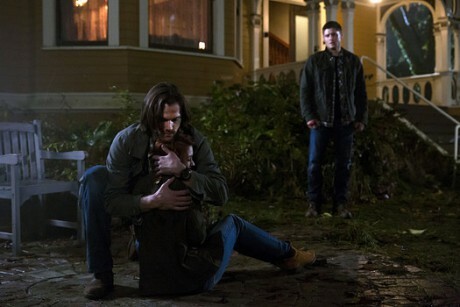 After Charlie leaves with the promise to hunt down a lore book in Italy, Sam once again tells Dean he believes in him; “You can do this, WE can do this.” Of course besides the fact that Dean will have to come to grips with his darkness in order to be healed, much like Charlie had to, it is also clear that Sam provides that balance he needs. In a way, one could argue that the brothers have always represented these two halves to each other. In the end I did enjoy the episode. The heavy parallels left me feeling somewhat removed and I still find the whole concept of Oz as a reality in the Supernatural world jarring and quite absurd. We suspend our disbelief plenty while watching this show, but introducing such a magical alternate “reality” goes too far for me. At times it felt more like an episode of Once Upon a Time, and as much as I can enjoy that show, that is not what the Supernatural universe looks like. It pulled me out of the story, which is a shame, because it had many good parts; one of which was Felicia Day’s performance, especially as Dark!Charlie. I also liked how the ideas of good and evil were explored in a more nuanced way. The cinematography was great and there were many beautiful and interesting choices made with movement and camera angles by director Phil Sgriccia. I have to give a special shout out to the VFX in this episode, the Wizard coming through the mirror and the re-merging of the two Charlies were truly spectacular effects. I do want to chastise Robbie Thompson for one particularly glaring example of sacrificing character for plot, a device I have been critical of all this season. To suggest that Sam Winchester doesn’t know how to hack into a bank account is a sin, I don’t care what point was being made regarding Charlie. I think I heard a collective gasp from most of fandom when that happened. I am looking forward to next week’s episode. I hope it will not slide too deeply into fairy tale territory and instead will focus on witchcraft, but I am excited to once again see Dylan Everett portray young Dean. I was impressed with his performance in Bad Boys (S9.07). I also think the premise could further develop the relationship between the brothers. Give us your thoughts below, we always love to hear from you.